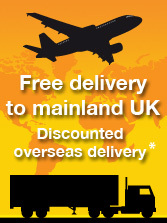 Collection box products can come in many forms. 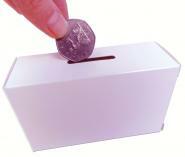 Charities need as much exposure as possible and one way to acheive this is to use a charity donation box or money collection box that stands out and will encourage contributions. 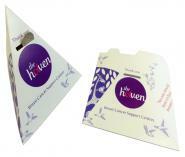 The Pop-up Cuboid is a traditional shape and easily identified as a collecting box. This product works well as a novelty advertising product to promote charities and generates great interest when designed as a “fines” or “swear” cardboard money box. 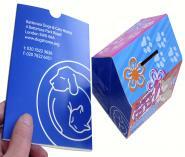 The pop up action also allows these charity collection boxes to fold flat to post making them a great direct mail idea. 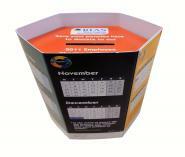 Collection box products with pop up action such as our Pop-up Cuboid, Pop-up House and Pop-up Cube are great charity marketing products to design as money boxes. 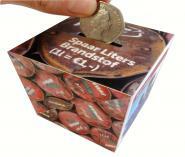 By adding extra novelty value to your cardboard money box you capture attention and ultimately an increased amount of contributions. When used as marketing products for business to business direct mail campaigns or by charitable organisations a collection box with impact and unusual style such as the pop up money box always work best. Charity collection boxes with a simple design such as our cardboard self-assembly money box cuboid may be the product of choice when you need to work within a small budget. 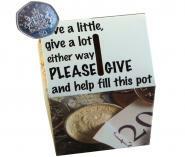 These are cardboard charity collection boxes that can easily be customised with your own graphic design or even low-budget self-adhesive labels. Available as a small cuboid, and now a pyramid shape as well, these are collection boxes that will stand out from the crowd and look appealing too.